One of the only good things about rainy days (like this one) is the possibility of seeing a rainbow. Today I’ve put together the perfect soundtrack for rainbow watching because I can’t go outside. Each colour is represented by a song (apart from pesky old indigo which has a band name instead). Enjoy! There’s a new trailer out for Transformers: Revenge of the Fallen – you can view it in HD at the official site. It’s about two minutes long and full of robots blowing things up. Cars, bridges, buildings, and even an aircraft carrier; it’s just that fantastic! We have the first Transformers film on DVD as well, if you need to catch up before the sequel’s release. We also have Transformers : Beast Wars series one and series three. The library has many copies of all Stephenie Meyer’s Twilight series of books (we have 43 copies of Twilight! ), but it’s still got a massive waiting queue of reserves. We have just purchased unabridged copies of the books in large print, so if you prefer reading 16 pt. lettering you might want to consider reserving a copy – the queue for them is (currently) much shorter. Free Realms is an MMO (massive multiplayer online game) that is due out later in the year. It’s free in that you don’t need to pay to play it (like you would with World of Warcraft, Warhammer Online, and others) and that you are free to do just about anything you want; you can race cars, raise pets, be a wizard, or whatever. It’s kid-friendly and intended for all ages. Open beta begins in April, and you can sign up for it now. Another MMO on its way is Star Wars : The Old Republic; an online webcomic set in the Old Republic, with new issues popping up twice a month, is available here. Registration is now open closed for the Almost Amazing Race! Once registered we will send sent you a registration pack with more information, things to sign … all that kind of stuff. If you’re registering as an individual, or haven’t made your team yet, fill in this form. Edit: You can also register on this page. 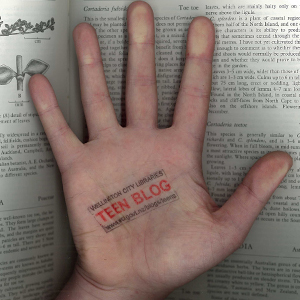 Any questions email us at teenblog@wcl.govt.nz. Click here if you’re wondering what the Almost Amazing Race is was. This week on the blog there was a flurry of activity. This is almost amazing. Thanks to James and the other generous people at Tory Street Noel Leeming, everyone who participates in The Almost Amazing Race goes into the draw to win a Canon digital camera (plus a 2GB memory card). Jack is modeling it for you to the right here. So make sure you and three friends enter; you never know, it could be you! 26.02.09 | Permalink | Comments Off on New books! Some new books. Not too many, but not too few; it’s just about the right number of books. I lie – loads more have come in. Impulse, by Ellen Hopkins (666 pages) – A truly ominous number of pages, you might think. But it’s a story told in poetry, so you’ll read this book quickly. It’s about three young people whose failed suicide attempts bring them all to a hospital, where they meet and heal one another. Sister Wife, by Shelley Hrdlitschka (269 pages) – Fifteen-year-old Celeste was born and raised in a religious cult called The Movement; women are expected to marry young and obey their husbands, and everyone dresses like Anne of Green Gables. Celeste wants to do something for herself, but breaking away would bring shame to her family. Pretty Monsters : Stories, by Kelly Link (389 pages) – This collection of nine short stories are all ‘weirdly wonderful and a touch macabre’, featuring aliens, dueling librarians (yes! ), pirates, an undead babysitter, and Tennessee Fainting Goats. Teen Inc., by Stefan Petrucha (244 pages) – Jaiden Beale’s folks were killed by some faulty equipment when he was younger. He was adopted by NECorp, the makers of the faulty equipment, and he’s been raised by committee ever since. However! He begins to rebel, uncovers scandal concerning NECorp, and may need to choose to bring the company down. The Faerie Queen’s Deception, by Maggie Stiefwater (325 pages) – Shy and introverted Deirdre discovers that she can see faeries, and is soon drawn into their dangerous worlds. The old Faerie Queen herself is at the centre of the intrique involving Deirdre and her pal, James. Vidalia in Paris, by Sasha Watson (282 pages) – Vidalia wins a scholarship to study art in Paris for the summer. While is Paris she meet two guys who fancy her; Julien, who works in a bookstore, and Marco, who turns out to be a bit of a criminal. Is it too late for Vidalia? I shan’t tell you. The Vampire Diaries – The Return : Nightfall, by L. J. Smith (586 pages) – This is the first in a long-awaited new Vampire Diaries trilogy. It will be very popular, no doubt; the Vampire Diaries are still being read, and the Twilight series has proven that vampires are more popular than ever. Zombies will be big in ’09, I reckon. Jet Set, by Cassie Karasyov and Kill Kargman (243 pages) – The Van Pelt academy in Switzerland has the richest girls, cliques, royals, and Lucy Peterson, an average American teen with a scholarship. The Lady Grace Mysteries : Keys, by Grace Cavendish (196 pages) – Young Grace Cavendish, Lady Pursuivant to Queen Elizabeth I, once again is determined to solve a most heinous crime. The Queen’s clockmaker has been found murdered, clasping a key. What can it all mean? Shadow Kiss : A Vampire Academy Novel, by Richelle Mead (444 pages) – This is the third book in an ongoing series. St. Vladimir’s Academy for young vampires is attacked by the Strigoi, Rose starts having dark thoughts and seeing ghosts, all the while determined to testify against the nasty Victor Dashkov. Youth Week 2009 – a little way off but worth checking out the official site, particularly if you’re keen to run an event. The theme this year: relationships. Answer some questions, win some stuff. 26.02.09 | Permalink | Comments Off on Answer some questions, win some stuff. The Library is running a Waitangi Day quiz! Answer the questions and you could win an MP3 player. Enter it here, but be quick as it closes on Saturday.